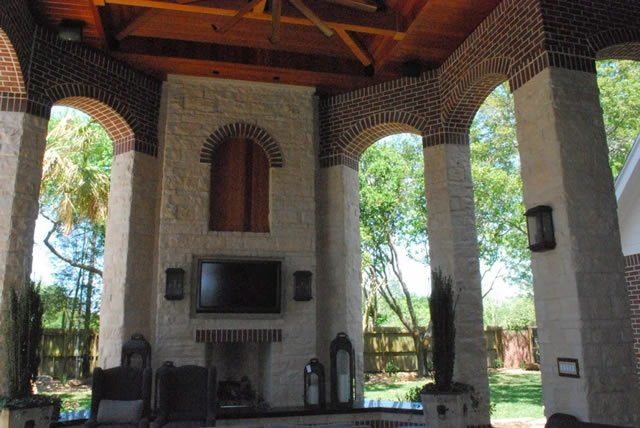 Looking to convert your covered patio from the simple chair in the patio look? Here are 5 outdoor room themes you can do that make your outdoors more inviting. Hit two birds with one stone by simply installing a support for a grilling plate on top of your fire pit. Now that will make having friends round the fire pit warmed up and stuffed with mouth-watering grilled food. Now you can cook, char and grill in the open air and not have your indoors smell like barbecue days after the event. If you prefer the chimney version of fire pits, why not consider adding a cooking slot for your breads, pastries and even pizza? Whether it’s just for your personal consumption, for entertainment or even for a hobby that might turn into a business, making a fire pit serve a second purpose will make your investment more profitable in the long run. On a moon-less starlit night, enjoy a cozy movie date under the stars courtesy of your own backyard movie theater. Pull down the tarp screen and start the projector rolling and voila! a romantic movie date without you two having to go out of the house. This depends whether you have kids or not. If it’s a playhouse for adults, store your board games and other recreation paraphernalia in a safe and dry storage. If you have kids, you can build a tree house or even a tent structure which they can treat as their hideaway and play area. Now you have more space indoors and have localized the mess in a separate area. Win-win situation for everybody! From a shower to a tub or even a Jacuzzi, install your rest and relaxation implements right in your own backyard. If you’re not so keen due to prying eyes, let natural privacy screens like tall shrubs or trees with thick foliage screen you. With these outdoor room themes, we hope you found something that’s worth considering. As with all home improvements, always look beyond the price and see what value it will be adding to your lives and real estate in the long run. Some may think there’s nothing we can do with a small patio but we beg to differ. Find out how by simply orienting the eye in different directions can create a huge impact for your small patio! Whether it is rows of well-maintained hedge plants or a pergola, placing plants or structures that create parallel lines trick the eye by making things in the distance look smaller. When working with a small patio, we tend to follow its natural direction for things, committing to its natural boxy or rectangular shape. By creating a diagonal or zigzag path, it fools the onlooker that the space is bigger than it seems. Leave as much open space you can in the middle to trick the eye that it’s larger than it seems. We’re not saying that you should just leave it as it is. Instead, prioritize utilizing the periphery of your patio to stretch the spacious illusion of the place. Avoid plants that tend to overcrowd the look of the already small patio. Opt for minimalist looking garden plants to create a spacious look to your outdoors. One most overlooked design feature is leveling. Raised decks, vertical plantings and wall-mounted plant boxes all free up space and distort the spatial perspective, giving the impression that there’s more to your patio. Need to store firewood, pillows and outdoor stuff? Make use of empty space under furniture, decks and stairs. A little creativity in storage spaces goes a long way to preserving space needed for foot traffic and plants. Home gardens and landscaping create a nice and serene atmosphere. That’s why if you have a green environment, take care of it so that it does not wither and die. Weeds are the enemy when it comes to plant care. Weeds suppress the growth of your flowers, fruit plants, and rob them of their health. Practice early weed control before they take over your plants. Below are some tips to help you. Tilling the garden is good for managing weeds. Loosen the top soil while turning it so that only the weeds are uprooted. However, be careful when doing it so that you do not rotate weed seeds. You should bury weed seeds deep enough to suffocate them and give your plants a chance to survive. Keeping your lawn thick and healthy removes chances for weeds to invade. Use thick ground cover plants to crowd out the weeds, especially in flower beds. Direct all the resources to the plants. Eliminate any open space that they may come to take advantage of by filling it with useful plants. Weak seeds produce weak plants that are easily taken over by weeds. Use high quality seeds when planting, even when it comes to planting grass. When shopping for seeds, ask the vendor to give you the ones with the highest purity and germination rates. Buy disease- and weed-resistant hybrid plants that will assist you in fighting weeds on their own. The healthy aerated soil is good for boosting plant growth while suppressing weeds. A good drainage system is also vital to your plants’ growth. Some weeds thrive when the soil has specific minerals while others can be suppressed using specific nutrients. To keep your plants safe, talk to a specialist on how to create an optimal soil fertility plan. Take precaution when applying fertilizer to ensure that it goes to your plants. If you are a small-scale farmer, you can torch the weeds with a landscape flamer that uses a propane tank. However, this method should be used with care to avoid torching the plants together with the weeds. It is good for removing weeds right before you plant so that you can do blanket torching. Mulching is the laying of dry leaves between plants to create a semi permeable plant bed and is very important when it comes to healthy plant growth. It blocks light from the weeds and subdues their growth. Not only does mulching help in weed eradication, it also helps with water retention. It decomposes over time and nourishes the soil. Choose your mulch material properly so that you do not introduce weed seeds from infested mulch in the garden. You can hoe the top soil and remove weeds manually. This is called weeding and it can be useful, especially with delicate plants and seedlings. Weed with care to avoid uprooting weeds together with plants. Some biological solutions include introducing beneficial insects to kill weeds and other pests. Consult a specialist to advise you on what method of bio control would be best for your garden, lawn or landscape. However, bio control is a long term project that may take a while to show results but bring about good results. A patio renovation can enhance the beauty and function of your home; so it’s also supposed to carry with it a lot of hope and expectation of good things. You can get the best contractor in the industry, but if you do not clearly communicate what you want, you will not get the outcome you want. Therefore, ensure that your contractor clearly understands your vision of a new and improved patio. Don’t give your contractor the whole amount before the work is done. Don’t start a project without having a clear financial plan to pay for all the work done. Don’t set a rigid budget; prices change frequently. It is great to be part of your patio project and to share your concerns with the contractor whenever possible. However, avoid changing important or major details of the project when it is already underway. Getting a professional to deal with your project is an important step towards ensuring an almost perfect job. But, remember to leave room for slight imperfections; or you will have a hard time, asking the contractor to keep redoing certain details of the job. That being said, the outcome should not be far from what you agreed on, especially if it is not a complicated design. You can have the biggest budget, the best ideas, top-of-the-line materials, and ample time to see the project through, but if you settle for an inexperienced or unqualified contractor, then you are in for a major disappointment. You should vet your contractor thoroughly by talking to his or her previous clients as well as to his or her suppliers and subcontractors. Most of the people who sign a contract that does not have a fixed budget end up spending too much money in the end, and most contractors know this. If you do not push for a fixed and justifiable price, get ready to pay more than you really ought to. Furthermore, the contract must reflect the responsibility of the contractor in case the project does not meet your expectations, as well as if the project does not last for a reasonable period. Concrete pavers are perfect for dressing your outdoors to keep them beautiful and neat. Outdoor pavers come in interlocking concrete bricks that are used to make pavements for outdoor dressing. They are strong, easy to maintain, and long-lasting. However, you must install them properly in order for them to withstand years of wear and tear. Also, it is important to call for a professional contractor so that you can avoid common installation mistakes. The following are installation mistakes that you can avoid. One of the most common mistakes is skipping a soil test. You should take into account the type of soil that you have. Clay soil shifts as time goes by, hence, it makes a bad foundation for concrete pavers. Wet or moist soil are not good paver foundations either. The concrete blocks soak up the water and they become weak and brittle. When you install on wet soil, it eventually dries up and shifts out of place. Make sure that the ground underneath is strong enough to hold cars, furniture and people walking on it every day. If you make the mistake of not ensuring that the ground is compact, then the concrete pavers will fit in loosely. You should have a mechanical system for pressing sand. In this case, hiring a compactor is recommended. A useful tip would be to pour water before the compacting process to make it easier and more effective. Otherwise, the pavers will loosely fit and you will have a repair bill every now and then. Make sure that the pavers fit snugly with each other to create a smooth compact pavement. Poor drainage is a threat to any construction work that you may have. In states such as Texas, the land is fairly flat in most areas. When it rains, water forms pools and ruins your pavement if you have poor drainage systems. Create runoff drainage systems to keep the pavement from waterclogging. If you do not have a sloping terrain, you can make your own by creating mild slopes as you install your pavers. This way, you easily direct water to the drainage system. As much as interlocking bricks have a simple installation method, it is important that they stick well together. Make sure that you have enough adhesive between the pavers to ensure a long lasting result. Also, be sure that you give the pavement some time to set so that the adhesive can work properly before allowing people to start using the pavement. Most people concentrate on the main outcome of the pavement and they forget to dress the edges. Pavement erosion starts with the edges and works itself towards the midsection. You should build a small perimeter edge all around your pavers to protect them from erosion. Make sure that the edge is raised a little higher to keep erosion away. Use heavy-duty material to bind the edge and make it stronger. If bricks come off, replace them immediately before the damage spreads to the rest of the pavement.